If we talk about the growth of cryptocurrency and Blockchain based project, then year 2017 was indeed a great year for initial public coin offering, as the total collection surpassed over$ 6 billion in valuation. Due to the blockchain technology, startups get vibrating platforms to raise the funds for the projects. It empowered new business to pitch their creative ideas directly and raise fund without any third party intervention. Due to the ICO, investors would get companies newly issued digital token in exchange for Bitcoin, Ethereum or other fiat currencies. The first ICO was developed for Master Coin in 2013 and later Ethereum released a coin in 2014 by ICO. In this article, we will discuss five interesting facts about initial coin offering. 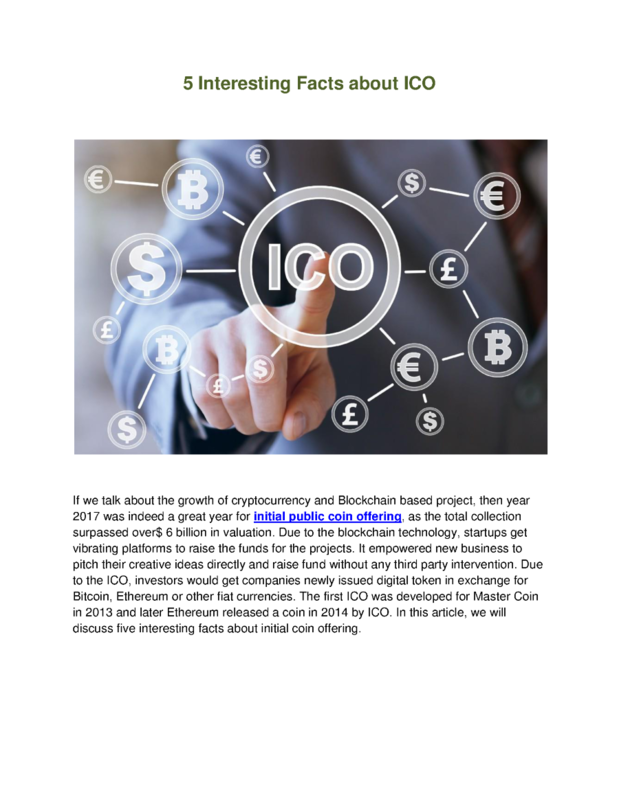 5 Interesting Facts about ICO If we talk about the growth of cryptocurrency and Blockchain based project then year 2017 was indeed a great year for initial public coin offering as the total collection surpassed over 6 billion in valuation. Due to the blockchain technology startups get vibrating platforms to raise the funds for the projects. It empowered new business to pitch their creative ideas directly and raise fund without any third party intervention. Due to the ICO investors would get companies newly issued digital token in exchange for Bitcoin Ethereum or other fiat currencies. The first ICO was developed for Master Coin in 2013 and later Ethereum released a coin in 2014 by ICO. In this article we will discuss five interesting facts about initial coin offering. The benefit of taking part in ICO: There are a lot of benefits of taking part in ICO including chance of getting money by selling token you have already purchased. At the initial stage of ICO tokens are sold in exchange of Bitcoin or Ethereum. But once products become full-fledged then investors can sell it for a large amount. The difference between IPO and ICO: There are many similarities between ICO and IPO but when it comes to ownership then released a share of company denote a share of ownership in that respective company in IPO but this does not happen in ICO the tokens are sold to the public. Where IPO is highly regulated by the government the same ICO is new and not fully regulated by the government. Some successful ICO in the past:  Filecoin works on storage and security of data raised fund around 257 million.  Tezos is a self-amending crypto ledger raised around 232.319 million.  Bancor is a prediction blockchain project raised fund around 153 million.  Status is a decentralized app raised fund around 100 million. The risk associated with ICO Initial public coin offering is a new concept and very few people are aware of it. So some risks are associated with it. One can judge the ICO by looking its development. Apart from that there is no way to distinguish between the genuine projects and the scams. So it is advisable that check thoroughly before investing.